The new compact disc featuring the Hope College Chapel Choir celebrates the long-standing relationship between the college and St. Francis de Sales Catholic Church of Holland. The church is, in a sense, even the choir’s second home. 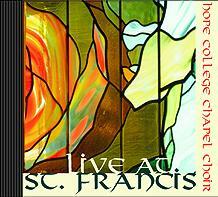 Titled “Live at St. Francis,” the CD includes 16 tracks recorded in 2010 and 2011 during the choir’s annual post-tour “Home” concert, which the group has presented at the church each March for the past decade. The choir presents the concert the Monday following its spring-break performance tour, a tradition that through the years has taken the vocal ensemble to both coasts, south and in between, as well as abroad. The Chapel Choir performs regularly in the college’s Dimnent Memorial Chapel, including not only concerts but during traditional college events such as Christmas Vespers each December and Baccalaureate each May. The choir was founded by faculty member Wilfred Curtis Snow, who came to Hope as the college’s organist and first full-time faculty member in 1929, the year that the chapel was completed. The 16 tracks on the CD include a work by Hope faculty member Jennifer Wolfe: “Hymne to God.” Wolfe is an adjunct assistant professor of music and director of the college’s Women’s Chamber Choir. The CD opens with “With a Voice of Singing,” by Kenneth Jennings. In addition to the piece by Wolfe, the other works featured are “O Sacrum Convivium,” by Don Michael Dicie; “Da pacem Domine,” by Håkan Olsson; “Agnus Dei (Mass for Four Voices),” by William Byrd; “Ave Maris Stella,” by Trond Kverno; “Salve Regina,” by Maria Loefberg; “Fern Hill,” by John Corigliano; “Les Sirènes,” by Lili Boulanger; “Oh! Susanna,” by Stephen Foster, arranged by David Duesing; “Maria Pancha,” by Cristian Grases; “Ngam Sang Duan,” by Steven Sametz; “The Stove” and “The Willow Plate,” both by Zae Munn; “Amazing Grace,” arranged by Ron Jeffers; and “Musicks Empire,” by Lloyd Pfautsch. The back cover of the CD case features artwork that serves as symbol of both loss and rejuvenation, the sculpture “Stelelation,” fabricated from a twisted steel remnant of the burned church. The sculpture has a Hope connection of its own: it was created by Billy Mayer, who in addition to being a parishioner of St. Francis is a professor of art at Hope. The front cover features a portion of one of the church’s stained-glass windows. The interior includes an arrangement of one of the Eames-designed choir robes, a blending of light and shadow. The producers were Richmond, John Erskine and Glenn Brown. Erskine also served as principal recordist, with Ryan Wert as associate recordist, and with Brown served as balance technician. The CD was mixed at GBP Studios in East Lansing, with printing and duplication by The Eastco Group of Orchard Park, N.Y. The booklet was designed by Mark Cook. Erin Gilbert took the photographs. Copies of “Live at St. Francis” are available for $10 at the Hope-Geneva Bookstore, which is located on the ground level of the DeWitt Center, on Columbia Avenue at 12th Street. The bookstore is open Mondays from 8:30 a.m. to 5 p.m., Tuesdays from 8:30 a.m. to 8 p.m., Wednesdays from 8:30 a.m. to 5 p.m. and Saturdays from 11 a.m. to 3 p.m. The bookstore can also be visited online at www.hope.edu/bookstore/ or called at (616) 395-7833 or 1-800-946-4673. Hope College is one of only 11 colleges and universities nationwide, and the only institution from Michigan, to receive a 2012 Beckman Scholars Program award in support of student research. Multiple Hope College students are being recognized by Michigan Campus Compact (MCC) for their dedication and commitment to service, including through one of only six “Outstanding Community Impact Awards” being presented statewide.